Jig saws are essential to any woodworkers, carpenters and to every home tool box because it is necessary to use in ay project or tasks that require different precise cuts and angles in a variety of materials. Its effectiveness and efficiency, however, depends on the quality of the jig saw that you will use, hence choosing wisely should be paramount. Because there are several kinds and models available in the market, finding the best one may not a walk in the park. This review is made with the intention of helping you find the best jigsaw that will suit your needs and preference. I needed to buy an all-around saw that I will be using mostly to cut basic woodworks yet at the same time I can count to be a useful tool to use for some heavy duty and complicated jobs that I may possibly be working in the future. I know that I want a jig saw because it fits the requirement power and performance-wise and it is especially handy and easy to store, which even works for me. Finding the best choice can sure be a tricky process. However, after series of reading and checking, my quest landed me to Black and Decker BDEJS600C 5.0-Amp Jig Saw and I couldn’t be any happier. It is easy to operate, convenient to use, versatile to use in any job and produces satisfying results. This jig saw is powered by a 5.0-amp motor and delivers a variable speed of 3,000 strokes per minute. It is efficient and versatile with its Curve Control technology and allows you to adjust the saw’s orbit in 1 to 4 customized settings and 45-degrees bevel cuts with adjustable beveling shoe for stability. It is also easy and convenient to use with its new and improved built-in wire guard for precise cuts and the keyless blade clamp for tool-free blade changes. Dealt DCS331B 20-volt MAX Li-Ion Jig Saw features an all-metal lever-action keyless blade change and an all-metal keyless shoe bevel that will provide you with versatility and convenience of using this jig saw. It is built to deliver a variable speed of between 0 to 3,000 strokes per minute. It is cordless, hence portable and available to use anytime. With a 7.0-amp power motor and a variable speed that ranges from 500 to 3,100 strokes per minute, no wonder this jig saw displays power, durability, and precision. Its robust aluminum footplate and industrial design can carry force up to 546 pounds and any possible tough job site conditions. 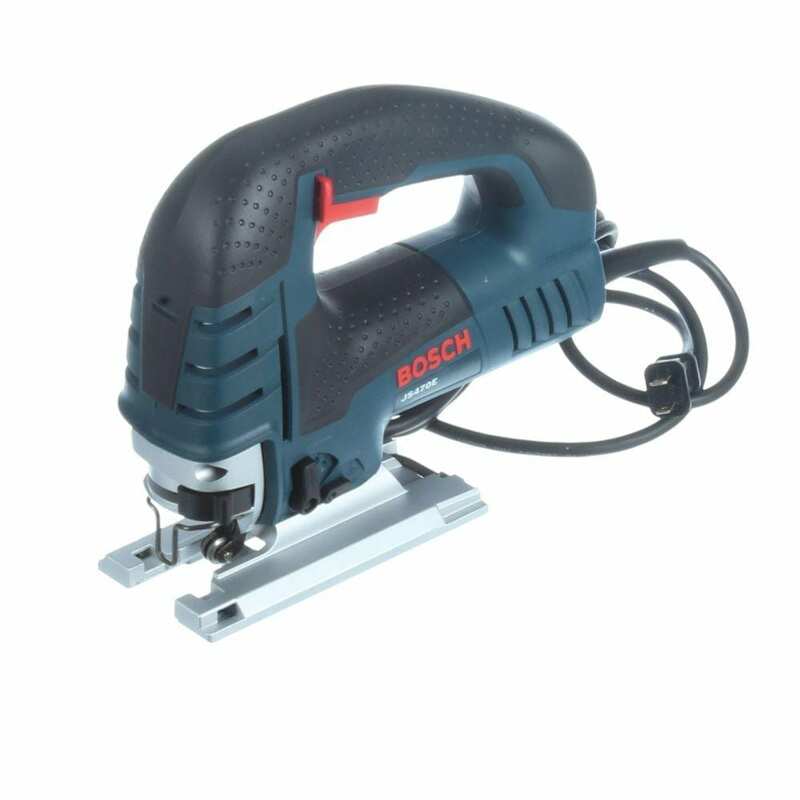 And as manufactured by Bosch, which is a brand known for engineering excellence, Bosch JS470E 120-Volt 7.0-Amp Top-Handle Jig Saw assures you to deliver and provide you with the accuracy and precision for any given job. Jig saws can be used by anyone who not only works and deals with construction, building and fixing any job or project that will require cutting of wood and other materials, but even those who are not professionally trained but have a huge interest and considers woodworking as a hobby. Jig saw are designed to cater to different needs, thus it carries high power motor and speed necessary even for heavy-duty jobs as well as the convenience of finishing simple DIY projects. Using a normal hand saw may be time and effort consuming and difficult to achieve the smooth and precise cuts that we need. Jig saws aim to provide its users both the efficiency and convenience, hence you are not only saving time and effort but money in the long run. It also increases your productivity because, with less effort, it produces your desired cuts in a less amount of time. And with the many kinds of models and specifications to choose from, you can definitely find one that will exactly fits your preference for optimal results. While there are many kinds of jig saw available in the market with varying brands, classifications and features, all however, agree on these following benefits. One reason why jig saws are a must-have in any woodworker or carpenters’ arsenal of tools is because of its capacity to make different sizes and angles of cuts, which is always necessary for most projects be it a professional gig or completing a DIY project at home. It can especially make curve cuts effectively and efficiently, which can be difficult to achieve when using other power tools. Jig saw is one of the few number of power tools that is possible to make bevel cuts. Most jig saws are designed cut up to 45 degrees angles. Some with high-end features offer you even several options to adjust its settings to create the right and precise cuts your project will require. This power tool can cut any kind of materials needed for any particular job, regardless of the density. Some of this jig saws are designed with a variable speed that makes it adjustable to use depending on your material, even makes it possible to cut in metals, steels, fiberglass and other heavy duty ones. You will be able to use different kinds of blade as well, thus makes it even useful and productive to use. Jig saws are designed to easy to operate and convenient to use even to novice woodworkers and those who are using it for a hobby or DIY project. It comes with different features such as easy blade change, lightweight, wire guard, dust bags and laser guide, among others that are all built to make your work experience easy-breezy and hassle free. When buying a jig saw, you have the option of picking either the corded-electric or the battery powered. Each has its own strengths and weaknesses as well as advantages and disadvantages when used. One advantage of using a cordless however is its portability. Because you don’t need to plug when using it, it is easy to carry around and available to use at all times, as long as you have equipped it with a charged battery. This makes it convenient and easy to store as well. So in case, you are considering of buying a power tool that has that portable capability, then jig saw can offer you that too. Because it is versatile to use in making different cuts and bevel angles and adaptable to any kinds of materials, jig saws are efficient to use. It can, therefore, increase your output or save time, as it can guarantee you productive and outstanding results in less time and effort. This power tool, though small and convenient to operate is not only limited to use for home and DIY projects. With its high-powered motor and variable speed, it can carry heavy-duty jobs and can be a useful power tool in job sites and any professional settings. Most are designed and engineered to have this capability, added by its other high-end and advanced technology features that make it an essential power tool for any jobs. Black and Decker BDEJS600C 5.0-Amp Jig saw offers you versatility, power, and convenience of use all combined to produce smooth and accurate cuts. Aside from the 5.0-amp power motor and a variable speed, it has other features as well such as customized orbit settings, wire guard, tool-free blade changes, and curve control that all makeup to one 5.2-pound power tool that is perfect for your all your projects. Its 5-amp motor delivers 3,000 strokes per minute power that allow you, its users to adjust the speed of the jig saw depending on what is required and necessary for the project at hand. Different types and thickness of materials will require different speed to produce easy and smooth cuts. And this jig saw can make that possible, hence makes it ideal for you to use it in any job. This jig saw is designed with the Curve Control Technology that allows you to adjust the saw’s orbit to 1 to 4 customized settings to match your project. It can also make bevel cuts up to 45 degrees in both directions. This is considering each task will require a different approach and cuts in order to achieve the desired results. These features will give this jig saw that versatility and productivity that makes it top of the line. This feature specifically promotes convenience and ease of use for this jig saw. It allows you to work with improved clarity and precision, as this will help you keep the saw in the exact cut line when cutting. This adds to your productivity level without sacrificing quality results. This is one important feature for your safety and comfort of use. This jig saw comes with a keyless blade clamp that allows the tool-free blade changes that can accommodate for both U and T-shank blades. This also saves you time and effort, thus another factor for improving productivity and efficiency when using this jig saw. Its saw’s orbit can be adjusted in 1 to 4 customized settings. The plastic power cord can be stiff to use especially on cold weather. This jig saw makes a great option if you are looking for a power tool that works great, versatile to use in any projects, produce smooth and precise cuts and convenient for home use. It can be used in several projects as it can be applicable to any materials needed for any particular given tasks. 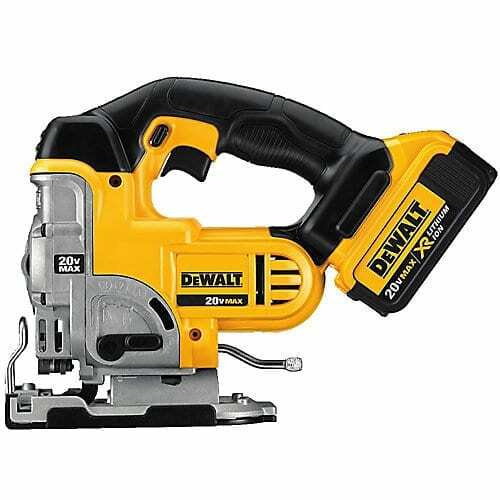 Dewalt DC331B 20-Volt MAX Li-Ion Jig saw has the convenience and portability of a cordless jig saw but has the same power and performance of any heavy duty corded power tool. It is durable, versatile and has great power to use in any job or tasks that make it a good option to use in any job sites and professional settings. It is easy and convenient to use as well. With a variable speed of from 0 to 3,000 strokes per minute, this saw is capable of giving you quality and efficient outputs for any project or job required. The all metal lever-action keyless blade change and the all-metal keyless shoe bevel makes changing of blades and bevel cuts quick and easy, thereby increasing efficiency and productivity of this jig saw. It is capable of making bevel cuts up to 45 degrees with detents at 0, 15, 30 and 45 degrees, thus can be used in different tasks that will need various precise cuts. It comes with a 4-position orbital action adjustable so you can control the cut quality and speed for a specific job. This jig saw is designed with an adjustable dust blower to keep your work area clean and free from any dust and debris while working. A rubber over mold grip is also built into the handle for a comfortable use and for ease in holding the jig saw even for a prolonged period. And since it is cordless, it is portable and can be used anywhere. Using a cordless jig saw has its convenience and advantages. Though sometimes pointed out to have lesser power life than a corded one, this Dewalt battery-operated jig saw, however, offers heavy duty and high power performance that can be used in any jobs and application. Plus it is portable and convenient to use without worrying about the availability of an electric power plug or source. Bosch JS470E Top Handle Jig saw is built with power, durability, and precision. It is powered by a 7.0-amp motor that guarantees robust performance that can withstand even the toughest job conditions and tasks. It provides you precise cuts in any materials used, hence makes this jig saw ideal for both DIY and professional jobs. This jig saw comes with four different orbital action settings that let you find the right blade strokes for smoother and more accurate cuts. This gives you several options as well depending on the material and tasks to be completed. Further to this, it runs a speed range of 500 to 3,100 strokes per minute, thus allows it to be capable of using even on hard materials. It is designed with an ergonomic top handle for a firmer grip and allows your hand to endure the long time use. In addition, it comes with a dust bag, too for a clearer and cleaner work area most especially on the cutline while working. It features an ambidextrous lock-on button for steady cuts and for the convenience of all its users. A tool-less blade ejection lever is built for ease of ejection without needing to touch the hot blades. This jig saw from Bosch is built with a cutting capacity of 5 – 7/8 inches on wood, up to 7/8 inches on aluminum, and 3/8 inches on mild steel. It can also cut bevel angles up to 45 degrees. And to be able to maintain the consistency of its performance on all these different materials, Bosch has developed the Constant Response Circuitry. All with these allows this jig saw to be a “go-to” tool for making precise cuts in a wide range of applications. If you are looking for a jig saw for your DIY projects but powerful enough to also use for a heavy duty work you may possibly do in the future, then this Bosch jig saw will take care of that for you. It has both capability to of high power and performance combined with a power tool that is easy to operate and convenient to use. 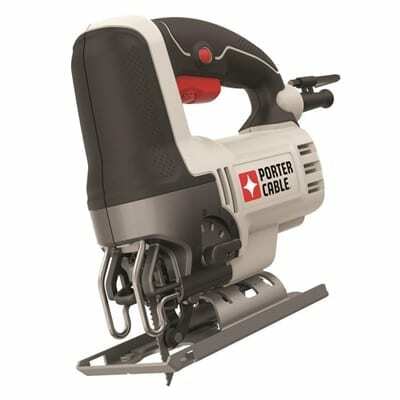 Porter-cable PCE345 6-amp Orbital Jig saw will provide you with multiple settings for versatility and proficiency. It offers you high power with its 6-amp motor, high speed and other added features for a high performance and output even on demanding applications. Its 6-amp power will allow you to use this jig saw in a variety of materials for different applications. This also makes this jig saw useful and a great option for any project of tasks that will require precise cuts and efficient performance. A lock-on button is designed to give you control for a prolonged use. This also will help you make consistent size of cuts. This jig saw also comes with an oversized front and handle over mold that gives you control and comfort when used. This jig saw is designed with a 7-position speed dial integrated into the trigger that will give you options for speed settings for a variety of optimal cutting results. It also comes with four orbital settings that will also give you outstanding performance on a variety of materials used for your project. If you are looking for a saw that is high in power, versatile and easy to use, then this jig saw fit the brief. You can be certain as well that it can cut accurately and precisely. And with its outstanding performance, you will be assured of a productive output. 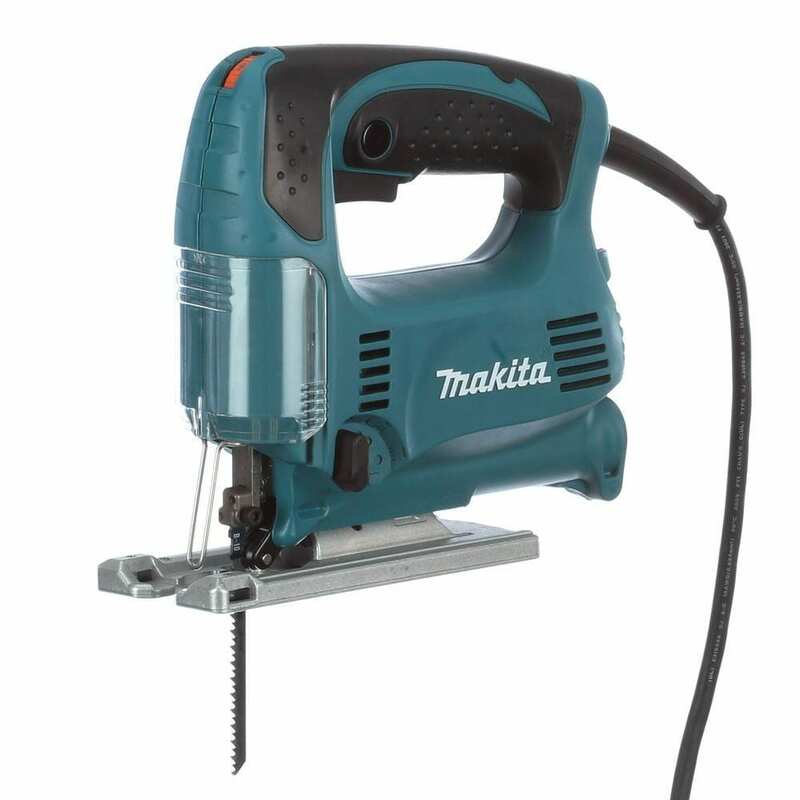 Makita is known as a worldwide manufacturer of industrial-quality power tools, hence this model of jig saw also offers you a high level of performance, efficiency and precision just like how its brand is known for. With a 3.9-amp power motor and a variable speed control dial of 500 to 3,100 strokes per minute, this jig saw can provide you optimal cutting performance in different precise cuts and in various materials for any project or tasks. This jig saw is designed to be user-friendly and convenient to use. It is built with an ergonomic rubberized grip for easy control and comfort. This will allow you to be able to endure holding the handle for a longer period, thus help increase your productivity and efficiency. It also comes with a through-the-body dust port that helps you clear the dust when working with the use of clear dust cover and vacuum. For added ease of use, this jig saw features a large trigger switch and a lock on button for extended use. It is made with a three-orbital setting plus straight cutting that allows this jig saw to be used in different kinds of materials and for different applications. Its die-cast aluminum base bevel cuts up to 45 degrees left or right with a positive stop at 90 degrees for a solid performance. With the high power and speed, backed with its other added features, this jig assures you a high performance, thereby increasing its productivity and produces more accurate results. And since it can be used in different materials, it has a wider range of usage and output. Engineered with high power and speed, Makita 4329K 3.9-Amp Variable Speed Top Handle Jig saw is ideal for home and for professional woodworkers offering you outstanding performance, versatility, and productivity of use. it is also equipped with features for your ease and convenience. Generally, customers like the fact that the product is high in motor power, performs as advertised and convenient to use. Some customers pointed out the easy blade change feature as a very useful component and that it is very comfortable in their hands when used. It also has plenty of power that it can be used in any material, even work well when used to cut on a metal door with no issues, as one customer narrated. However, it can be high on vibration when used for longer period. Not just one customer mentioned about the material of the power cord to be a little inferior that sometimes it becomes stiff especially in cold weather. Other than that, this jig saw is a great option and perfect to use for any projects. Since the market offers a number of different brands and models of jig saws to choose from, we have listed these other ten options that you might want to check out. Powered by a 6-amp motor, Skil 4495 orbital Action Laser Jig Saw will give you high performance, power, and precision in working with any materials on various projects. It has the 4-position orbital cut control that will allow you to adjust the jig saw to the type of cut you desire. It is designed with a built-in laser guide to add visibility and clarity to the cut lines when used, thereby increasing your efficiency and productivity. And with its variable speed trigger, it will let you adjust the speed to cut. It has an adjustable footplate that will provide with different bevel cuts of up to 45 degrees. Bosch JS120BN Cordless Jig saw uses only 12-volts yet provides you with performance and reliability. It also designed with small grip diameter for a comfortable use and reduce fatigue even on prolonged use. It has an on-board bevel wrench storage for a convenient blade change and an exact fit insert tray to have everything organized. Porter-Cable PC600JS Orbital Jig Saw is built with a 6-amp motor power, 4-position orbital lever, and a 7-position speed dial that will provide you with efficient performance and versatility. With its 3,200 strokes per minute (SPM), it makes cutting in different materials and various application possible. It is designed with a soft-grip handle and front grip area for comfort and convenience of use. The lock-on button, on the other hand, will give you control for long use. It comes with a LED light as well for increased visibility when using this jig saw. This jig saw comes consist of a keyless blade change system that allows it to accept both universal and t-shank blades. It is designed with a tool-free adjustable shoe that slides forward and backward and a bevel that tilts 45 degrees in both directions. It also comes with 3-positon orbital setting with a counter-balance mechanism. It can cut any material including wood, plywood, laminate countertops, plastic, and metal with its variable speed with a range of 0 to 3,000 SPM. Its other features include 1-inch blade stroke length, keyless lever-action blade, a clamp for easy blade change, four-position, orbital-action switch, top handle design, anti-slip grip, and adjustable blower for increased efficiency, precision, and versatility. Black and Decker BDCJS20B Lithium Jig Saw is ideal to use for detailed precise cuts for a number of different materials with its powerful motor that delivers 2,500 SPM. It features a variable speed trigger for increased control when used. For comfort and convenience, it comes with a built-in dust blower and a wire guard to provide added clarity and visibility of the cut line and work area especially helpful for detailed cuts. With a 6-amp power motor and a variable speed control of between 500 to 3,100 SPM, Makita JV0600K Top Handle Jig saw delivers fast and more accurate cuts in a variety of materials and tasks. Weighing only 5.2 pounds, it is lightweight, thus allow you to use it for a longer period, increasing your productivity and efficiency. It comes with a built-in dust blower to clear your cutline and work area from wood debris while working. It is designed with an ergonomic rubberized grip and a 2-finger trigger for added comfort of use. This Milwaukee 2645-20 18-Volt Jig saw is the very first jig saw from Milwaukee that is powered by lithium-ion. Designed for versatility, it comes with a 5-position orbital setting that will allow you any type of cut or speed needed for a specific project. It is also built to provide comfort and convenience with its tool-free shoe bevel for a fast and accurate shoe adjustments and a quick-lok blade clamp for an easy blade change. This jig saw comes with a Line Finder feature that provides clear visibility to the cut line and workspace while using it, thereby increasing accuracy and efficiency. Black and Decker JS670V Jig Saw is also designed with an Accu-Bevel Angle Adjustment gives you accurate bevel adjustment with an action lever and indicator window. It is designed with on-board blade storage for an easy access to blades. And with its tool-free blade, it makes blade changes quick and convenient for you. Ryobi P523 Cordless 18V Orbital Jig saw is designed with a new and powerful motor from Ryobi that will provide you the high performance and capacity of a corded tool but with the portability and convenience of a battery operated jig saw. It features the patented Blade Saver innovation, which is has a drop base design that allows the user to adjust the blade in a way where you could utilize even the unused teeth to maximize the blade use. It comes with a variable speed of between 1,100 to 3,000 SPM that allows this jig saw to cut any materials on any given project. It has a sight line blower as well that clears the cutline and your work surface from saw dust and shavings while working. Recorded to be the lightest in its class, this jig saw is built with power, precision, and comfort, which includes having less vibration and noise. It is also designed with a large 2-finger variable speed trigger for a more convenient operation. The tool-less blade change feature allows you to the installation and removal of this jig saw’s blade quick and easy breezy. Makita XVJ03Z 18-Volt Jig saw delivers 0 to 2,600 strokes per minute to offer to fast, efficient and precise cuts in various wood jobs and with its three orbital settings, it can be used in a wide range of materials. To have smooth and precise cuts of wood for your projects, having a good jig saw in handy is the answer. It is not only guaranteed to give you outstanding results but is also convenient for you to use and operate. 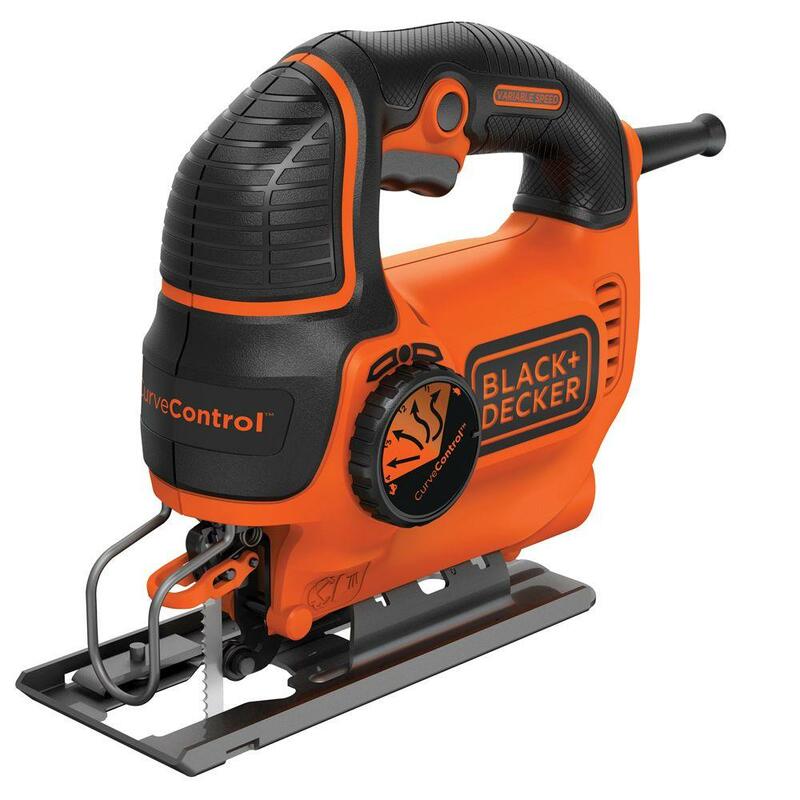 Black and Decker BDEJS600C 5.0-Amp Jig saw is for me the best choice because it can give you the performance and efficiency you will need and at the same time, the tool is designed to be user-friendly that it is ideal both for home and professional use. If you think this works for you too, you may click here to check for more about this product.